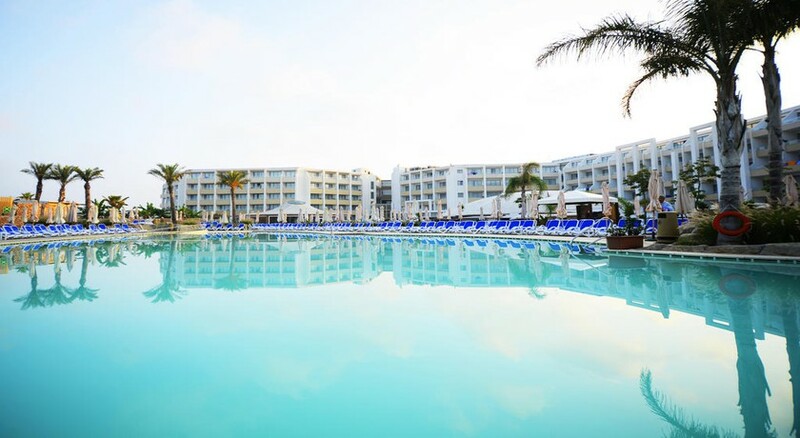 The DB Seabank Resort + Spa is a luxury all-inclusive resort nestled in a quiet location in Mellieha, next to L-Ghadira Bay. 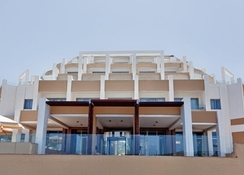 This 4-star hotel is one of the best choices of accommodation in the L-Ghadira Bay area, offering modern guest amenities and warm hospitality. An indoor as well as an outdoor pool, indulgent spa facilities and a wide array of dining options and bars offer guests the desired tranquillity during their holiday in an all-inclusive oasis of luxury. Guests can avail the advantages of free parking for each room, and free use of sauna, Turkish bath, and hot tub. The modern, contemporarily furnished air-conditioned guestrooms come with satellite TV, tea/coffee maker and free Wi-Fi. An entertainment program for adults and a kid’s club are also available. 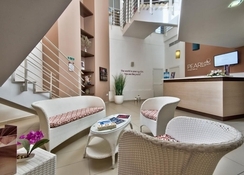 The hotel is located in quaint Mellieha, next to L-Ghadira Bay with the distance to the beach not more than 200m. The National Wild Reserve is barely 650m away. The distance to Malta International Airport is 25km. A local bus service is available from the stop just outside of the hotel and plies to Valletta, 26km away. 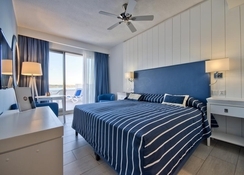 Rooms at The db Seabank Resort + Spa All Inclusive have contemporary décor and painted in nautical color and are equipped to provide rest and relaxation to guests. These come equipped with 32” flat screen satellite TV, a fridge, free Wi-Fi, tea & coffee maker, a safety deposit box, and a balcony providing excellent views of the sea, pool or the countryside. There is a room type to suit the space requirement of all types of guests – Terrace, Family, Standard, Accessible and Caverna Suites. The db Seabank Resort + Spa serves a self-serve buffet breakfast served at the Coral Restaurant comprising pastries, cold cuts, fresh local bread, fresh fruits, salads, foreign & local cheeses, milk, yogurt and a variety of cereals. Late breakfast is also available at Laguna Pool restaurant till noon. The hotel has several restaurants serving varied cuisines where guests can truly indulge their palate—Coral, Laguna and Tramun Taghna for international, La Pellicola for Italian, Jungle for American, El Rodizio for Brazilian and L'Orjent, Amami for Asian. There are a number of casual bars and a beach club for the guests to unwind with a drink. The DB Seabank Resort + Spa has an indoor and another outdoor pool with a sun deck where guests could soak up in the sun. The spa offers relaxing massages or beauty treatments by prior appointment. Guests could avail free use of sauna, Turkish bath, and hot tub for a rejuvenating experience. There is a hair salon at UG level. Guests who wish to stay active can head to the fitness centre. Facilities for aqua aerobics, dance classes, beach soccer, Pilates, Zumba, beach volley, mini golf are there onsite. The Kid’s Club has varied programs for tiny tots all through the week. There are lively entertainment programs every evening. We have been here twice and it's the perfect getaway for a couple. They have everything we could need, entertainment, lovely pools spa. The trip to town is a good ride but worth it.The food is generous and plentiful with a good selection so you will put on weight. The self service bar is a must. All round good for everyone families children teen's and solo travellers and couple's as everyone is really friendly. You get more than your money's worth. The room was very spacious and cleaning was done every day. The staff were amazing!! Excellent customer service throughout!! The hotel is a bit far from the main tourist areas but the bus service was very regular right outside the hotel. Bus fares very cheap, ask the hotel staff. Went with my wife and had the most amazing time at this hotel it really is the best on the island, the staff were very helpful the room was cleaned often, the food offered was so much choice that we put on weight and was delicious,. Then the evening entertainment was like being at a west end show every night, During the day you could laze by the adults pool with a self service bar or relax in the Jacuzzi or got to the steam room. I was able to play bowls and had a go at archery while my wife also did acquarobics and yoga. All that said best holiday for a couple or family as lots of open space and across the road from the lovely beach. Very nice place to stay. Room lovely. Sauna and steam need servicing. Wasn't hot. Everything else grand! This was my 2nd trip. The hotel was great and there was quite a bit to do and see. Hotel staff were great. Staff very friendly and very helpful when i required some printing. Entertainment excellent and food very good. Would stay again and hope to do in the future.